Though Kathryn Budig might object to being called a yoga superstar, she certainly is one to me–and not just because she can rock some of the most mind-blowing, beautiful poses I’ve ever seen. Her teaching style is fun, strong and transformative, in both the asana practice and the nuggets of how-to-do-life wisdom that she drops throughout her classes and writing. She is a noted champion of body positivity, authenticity and self-acceptance–much like beloved pinup queen Bettie Page–and that’s why I thought Budig would be an excellent person to interview for BettiePageFitness.com. Learn more about her new book, Aim True: Love Your Body, Eat Without Fear, Nourish Your Spirit, Discover True Balance! and check out what she had to say below about fearless eating, self-love, and of course, Bettie Page. 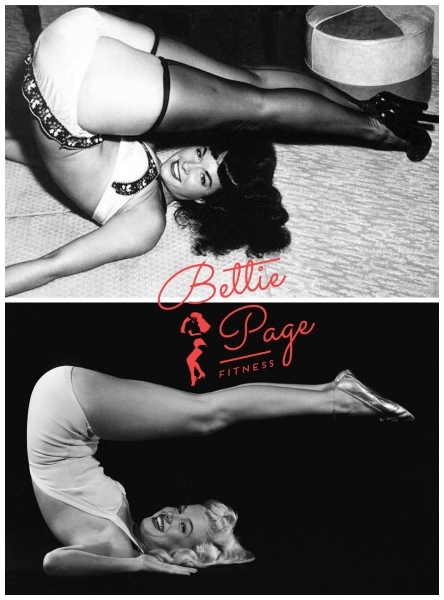 Bettie Page Fitness (BPF): Congrats on your new book! I strongly suspect from its description and name that readers can expect lots of that signature, infectious Kathryn Budig joy and encouragement to embrace ourselves as we are while challenging ourselves with love–to me, that is the essence of body-positive fitness! Am I right, and what else can we look forward to in the book? Kathryn Budig (KB): Of course! I put a lot of time and effort into the thought process behind creating this book, because I didn’t want to turn it into another self-help book that lists all the things that are wrong with you. I wanted to start from a place of encouraging the reader to understand that where they are right now is fantastic, but then ask them the following question: What are the tools we can develop to make ourselves even better? BPF: One of the things that jumped out at me–and which I love–is the part of your book’s title that says “Eat Without Fear.” As a psychotherapist, fitness expert and Ayurvedic health coach specializing in food and body image issues, I believe that’s a powerful message that can’t be shared enough. Can you say more about it and what prompted you to make it an area of focus in your book? KB: I’m an avid lover of food, but I’ve also been in the health world for years, and so I’m highly educated on the value and details of nutrition. And I’ve found that most people differentiate between “health” and “enjoyment.” They convince themselves they can either eat decadent or they can eat healthy. I wanted to bridge the gap, because I believe that you can nourish your body without taking away any of the enjoyment that food brings. I love that the world is moving in a direction that’s more conscious of food decisions, but sometimes that seems to also become very restrictive and creates neuroses, so I try to give people the tools to create true balance in the way they eat. So, eat that kale salad, but don’t be afraid to pair it with a glass of red wine! BPF: I often take your classes on YogaGlo.com and read your work online. I’m a huge fan, and it has struck me that some of the head and heart stuff that you teach in class is similar to the things I teach clients one on one. You are incredibly wise, insightful and therapeutic! What steered you down the path of being such a fierce advocate for self-care, self-acceptance and authentic living? KB: I think everything starts with how you take care of yourself as an individual, and I desire nothing less than to live the most embodied, passionate life possible. And in order to do that, I have to know what lights my fire and what makes my heart beat, but I also have to – as cliché as it sounds – absolutely love myself. So it starts with the self work and then, in doing that and discovering what works for me, offering that to my students, so that we can all help each other love who we are and support each other in that endeavor. BPF: Whether in fitness or life in general, what are some things that help you treat yourself with kindness and compassion rather than with criticism and perfectionist pressure? KB: Perspective. It’s called being human, and the human condition is to be objective and critical, so I don’t know if there’s ever such a thing as quelling that voice, but I’ve found that if I take a moment to step back when I’ve moved into a place of negativity, that often it allows me to see the bigger picture and not just the fictional story that I’ve told myself that has usually led me to the negative space. BPF: Clearly, Bettie Page is one of my fitness and life muses. Who are some of your top sources of inspiration in either or both areas? KB: Seane Corn has been a huge mentor, guide and friend on my journey and she was the first person to tell me that I had a voice and that it was important that I use it. Also, Maty Ezraty trained me and will always be my teacher and I owe my teaching career to her. Ashi, my 10-year-old Puggle, has been with me every step of the way and constantly reminds me of what actually matters in life when I start to go off the deep end. And finally, my friends and family are the ultimate support system. They listen to me even when I’m completely irrational. They humor me and keep it real. BPF: I was so surprised and excited when I realized Bettie was into yoga, first from her photos and then from firsthand accounts of people who knew her. What are your thoughts about her yoga-esque poses? KB: They’re beautiful. They’re reminiscent of the famous Marilyn Monroe yoga photos, and both women embody that old-world glamour that somehow seems to be lost today. I love the combination of playfulness and sexiness. It always brings me joy to see an empowered woman embracing who she is. BPF: Where do you think someone like Bettie–a working model in NYC, generally–would have learned yoga back then? Marilyn Monroe is said to have perhaps learned from Indra Devi’s writings, and there are those beautiful photos you mentioned of her in various yoga poses. But it's not known where Bettie learned, though she did work out at the gym regularly and could have learned from someone there. KB: It’s hard to say–maybe she learned from books. That was an era where yoga was still predominantly male, and Indra was incredible innovative and the first of her kind. So, I’m not entirely sure where Bettie would have learned from, but it shows that she had some prowess and moxie, learning wherever she could. It has been an absolute fan-girl pleasure to interview you, Kathryn! Thank you so much for all the goodness you bring to my life and to the world!